Inter captain Mauro Icardi reiterated his happiness at the club as the former Barcelona youth product prepares to return to Camp Nou. Icardi's future has dominated headlines amid links with Champions League holders Real Madrid, Premier League giants Chelsea and ex-team Barca. The 25-year-old forward is out of contract in 2021, a deal which reportedly includes a €110million release clause for foreign clubs. However, Icardi said he is settled when speaking ahead of Wednesday's Champions League clash in Barcelona, where the Argentina international spent three years before joining Sampdoria in 2011. 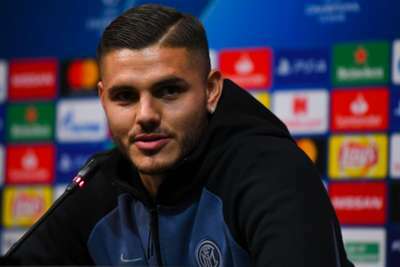 "As I have said so many times, I am very well in Milano, I feel very good at Inter, my family is very good in Milano and right now I don't have any intention to leave," Icardi said in a news conference. "I had [a] few offers last summer but right now I don't feel the need or the desire to leave Milano. "Playing for Barcelona's academy was a very important time for me and my career, as I learned a great deal here. I started my career here and facing them as a player in the Champions League is undoubtedly special and exciting. "However, when I had the chance to come to Italy with Sampdoria, I didn't need to think twice. It was the right decision for me and my representatives." Inter will face a Barca team missing talismanic captain and five-time Ballon d'Or winner Lionel Messi. Messi suffered a fractured arm in last week's 4-2 victory over Sevilla in LaLiga but Inter head coach Luciano Spalletti insists the Spanish champions remain a difficult opponent even without the club's all-time leading scorer. "It's clear that those players that will have to replace Messi will want to show all their qualities...Messi is a different type of player," Spalletti said. "Because Messi is one of those players that even when you think you have seen everything in football he's able to perform in a way that shows you something new and unique. He's always able to create a bit of confusion in the opponents' defence. "Barcelona remain though [even without Messi] a team that does not need to run behind the ball. A team that have so many qualities if they are in control of the game to find [a] solution to beat any opponent. "That's why I think our task, it won't be how to close space for one or another player, but to be capable to have the control of the game. I know it may sound weird when you face Barcelona in their stadium but if we want to have a chance [to win] we need to hold the ball longer than them."